As we have described a number of times at GigaOM, journalism has become something virtually anyone can practice now, thanks to social tools and digital media. This democratization of distribution has had a profound effect on the coverage of uprisings in Egypt and Libya and more recently in Syria. Thanks to YouTube, (s goog) Twitter and other networks, more information is available about what is happening in those countries. But is it reliable? According to some reports, the news coming from Syria has been altered by activists who are trying to make a specific point. Does that mean citizen journalism is flawed? Not really. It just means that we need better tools to make sense of the flood of news that is all around us. Carr is right, at least in the sense that what is missing when we try to understand a place like Syria or Egypt through YouTube videos or Twitter is context. How do we know the videos or reports we are getting are true? Channel 4 said on Tuesday that it has discovered at least one video of the city of Homs was altered by the person who uploaded it, with a cloud of smoke added to the picture. The video journalist who took the video admitted that he altered it and said he did so to raise awareness of the violence taking place in the city so the world would respond. This sounds a lot like the arguments that some observers made in defense of Mike Daisey, whose report on Public Radio International about visiting Apple factories in China turned out to be partially fiction. Some — including Daisey — said his embellishments were justified because they exposed a larger truth about Apple and its conduct in China, while others said any altering of facts made the entire story suspect. One of the issues in a place like Syria or Egypt is that much of the reporting we get from nonmainstream sources almost inevitably comes from people who are either involved with a rebel group or are friendly toward it (although it should be noted this is the case with much traditional foreign reporting as well). This phenomenon was also seen during the Occupy Wall Street demonstrations, when video reporters like Tim Pool emerged to tell the story of the protests and developed a large following very quickly, despite making it clear that they didn’t see themselves as journalists. One response to this phenomenon is to lament the loss of traditional foreign reporting, as Carr seemed to be doing in his tribute to Colvin, and criticize the emptiness or unreliability of YouTube videos and citizen journalism. But another response is to see the value of the phenomenon — as Nick Kristof of the NYT seemed to in comments he made about citizen journalism and the Occupy movement — and try to apply journalistic principles to this maelstrom of content coming from a thousand different sources, some reliable and some not. This is what the BBC does with its user-generated-content desk, which sits in the newsroom and filters and verifies reports coming from Twitter, YouTube and Facebook. It’s not that I’m just using Twitter and integrating other forms of journalism — it’s that I see Twitter as the newsroom where I spend my time. Whenever I write about what Carvin is doing, someone inevitably makes the argument that what he is doing isn’t “real” journalism, which presumably consists of flying to these locations and reporting on camera the way we are used to. The argument seems to be that since Carvin is sitting at his desk monitoring Twitter (and using the telephone), that he isn’t really doing journalism. As I have argued before, this is absurd. Carvin is applying exactly the same journalistic principles that traditional reporters always have, including the duty to verify facts. He is simply applying them in real time and in full public view, which is arguably better than the traditional alternative. Citizen journalism and the rise of social media don’t mean that we don’t need traditional foreign correspondents anymore, or traditional reporting. If anything, we need those kinds of skills even more than we ever have. But the globe-trotting war correspondent is no longer the only game in town when taxi drivers can report bombings just as easily as a CNN crew, and training the new breed of curator journalists may involve Twitter and YouTube lessons instead of flak jackets. In the end, as Jay Rosen has said many times, journalism gets better when there are more people doing it. There is also the problem of how consumers of news are supposed to weigh what they’re reading or watching. Obviously, professional journalists can and do get stuff wrong, but if we’re reading something on the Bloomberg wire, we tend to assume it’s true until we learn otherwise. 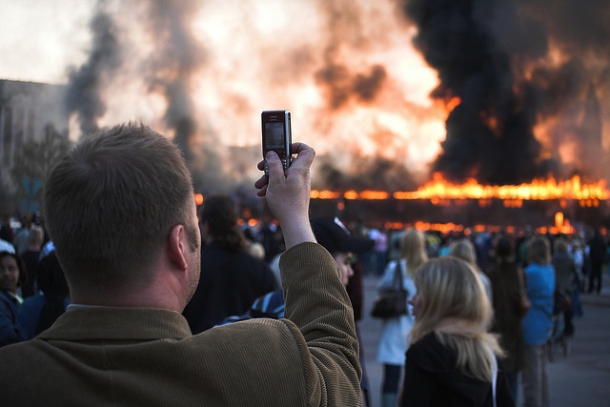 With “citizen journalists,” as with all unvetted eyewitness accounts, we have no actual idea. At least, unless and until that eyewitness has established a reputation with a track record of veracity, which rarely happens. When I see “citizen journalism” I assume the person using the phrase is less interested in actually examining the phenomenon than in pursuing an intellectual agenda. The dissemination of information by eyewitnesses and other non-journalists is fascinating and of course has all kinds of implications, good and bad, for the media business. But by insistently calling it “citizen journalism” you are (purposely, I have to assume) making the discussion not about the phenomenon itself, but about whether journalism is, or should be, even considered a profession. Who needs plumbers when we can all be plumbers? See what I mean? Thanks for the comment, Dan. I wouldn’t say I have an “intellectual agenda” per se, but I do believe that the scale of what we are seeing is unlike anything we have seen before, and that deserves its own term — whether it’s “citizen journalism” or “eyewitness journalism” or something else. As for the whole “citizen plumber” debate, we have always had amateurs in lots of professions, and journalism is no different — but the barriers to entry into the practice of journalism and publishing in general are lower than virtually any other industry, and that makes what is happening in journalism unique in many ways — and while journalism takes certain skills, those skills are far more widely distributed than I think journalists would like to think. Appreciate your thoughts. Once the citizen journalist cares about an outcome, if the opposition is sufficiently well funded and skilled and unscrupulous, and has enough time to craft new scenarios and build on old ones, they’ve got you. Concern for any outcome will do. I’d really like to know if there’s a structural fix to this. And concern for any outcome is sufficient. I’d really like to know how this situation could be fixed. Two copies? One is plenty; especially since I could be mistaken. “According to some reports, the news coming from Syria has been altered by activists who are trying to make a specific point. Does that mean citizen journalism is flawed?” Yes, citizen journalism is flawed, but so is “professional” journalism; “altered by activists who are trying to make a specific point” sounds an awful lot like Fox “News” or Andrew Breitbart’s infamous, selectively edited videos of Shirley Sherrod and others. Even if it doesn’t involve doctored photos, any reporting represents some perspective, and it’s sensible to stay alert to the possibility of distortion, either accidental or deliberate. As Jay Rosen suggests, more journalists is better, provided they’re genuinely independent. Totally agree, Ralph — traditional journalism is at least as capable of being unbalanced as the citizen kind, if not more so. Thanks for the comment. I agree with most of what you’ve been writing, but I think there is an important caveat: Revolutions are terribly confusing things (I should know, I’ve not only been in one, but was managing a major news organization at the time). There’s lots of information flying around, most of it bad. That’s not to say that citizen journalists aren’t important, but I do think that the dull but important parts of journalism are often overlooked. Checking facts, confirming sources, etc. 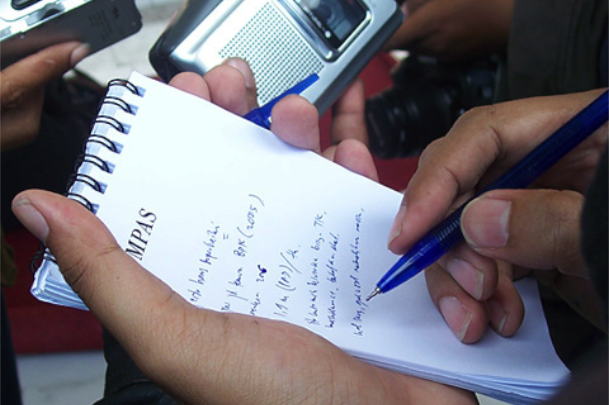 are all crucial, but unheralded, functions in a news organization. Thanks, Greg — I agree. I did try to make that point in the post. I think we need those things more than ever. Appreciate the comment.